Friday, June 15 at 2pm EDT! Right now, we are towards the end of Expedition 376, situated over the Brothers volcano approximately 400 kilometers northeast of New Zealand. We are retrieving analyzing core samples and borehole data from three different locations at Brothers volcano. Core samples and data are being used to determine the composition of fluids at depth, the chemical reactions that take place on the way to the seafloor, and how various metals are transported and deposited within the seafloor. We are also examining the effects of acidic environments on the microbes that live in and around hydrothermal systems. Dr. Iona McIntosh is a scientist in the Physical Properties team on Expedition 376. She is a British volcanologist who works in Japan at the Japan Agency for Marine-Earth Science and Technology (JAMSTEC). She studies the gas contents of volcanic rocks like lava and pumice in order to investigate the causes of different eruption styles. She is especially interested in how submarine volcanoes erupt, and their potential hazards. Kannikha Kolandaivelu is a final-year PhD candidate racing towards her finish line this October at Virginia Tech, USA. She is currently figuring out how much of Earth’s heat is leaking into the oceans, especially in submarine volcanic environments. She also integrates this heat flow with hydrothermal fluid circulation. She is very passionate about sci-fi and writes reasonably OK short stories in her spare time. Dr. Lanlan Cai is a postdoc from College of Ocean and Earth Science at Xiamen University, China. Her research focuses on phages (viruses that infect microbes) diversity in marine and deep sub-surface ecosystems, as well as the co-evolution of microbe and phage in environmental populations, which will help us to better understand the roles that microbes and their viruses play in global system. Susan, Iona, Kannikha, and Lanlan (and myself!) 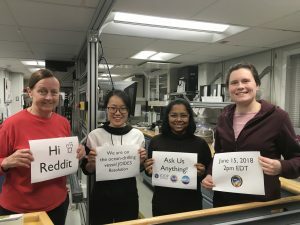 will be on Reddit from 2pm – 4pm (EDT) on Friday, June 15 to answer your questions about our expedition or ocean exploration in general…hope to hear from you!